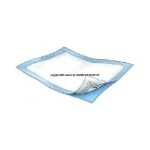 The underpads below, both disposable puppy pads and reusable puppy pads, are a great aid in potty training a puppy or for use in the older dogs who are incontinent. They help protect your furniture and flooring while absorbing the "accidents". They are available in a wide variety of sizes. This size you need will vary depending on the size of your dog. The reusable ones do not bunch up and can be put in your washer and reused over again. The busy schedules we all have make it difficult sometimes to be there when the pet needs to go outside. These reusable puppy pads and disposable puppy pads eliminate the worry of the time spent away from your pet and their needs. And at the same time give your furniture and floors protection from stains. The disposables would be great for breeders and rescue centers for their crates and kennels. They are economical and easy to use and dispose of.